You know something? It is a whole lot easier to be a backseat driver, as you tend to be able to make all of the correct decisions that the driver him or herself was seemingly unable to make when they are at the wheel. Same goes for high stakes Formula 1 racing, where being in the comfort of your living room, you can cuss at the driver’s decision, but you have never really placed yourself in such a high pressure cooker situation, have you? 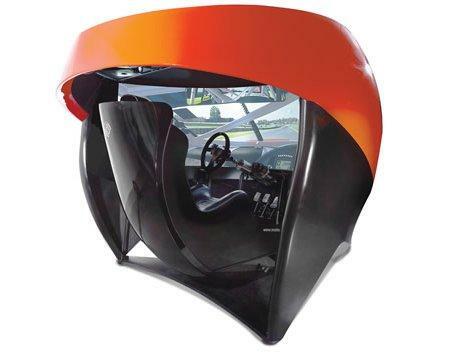 Perhaps it is time to change things and give you a tiny taste on what could be – with the $58,500 Full Immersion Professional Racer’s Simulator. Yes sir, with that kind of money, you can buy yourself an exotic race car (on the low end side of things, though), but at least with the Full Immersion Professional Racer’s Simulator, you would not have to worry about stuff such as insurance claims, folks scratching your car out of jealousy and the ilk. The Full Immersion Professional Racer’s Simulator is said to be the only racing simulator in the market to come with a 180°, 106″-wide HD screen which will keep you immersed in a high-speed virtual car race of unparalleled realism. 7 million-pixels will wrap themselves halfway around you, showing the window net, side mirrors, and passed cars in your peripheral vision as though you are in an actual vehicle. 57 renowned race circuits, including Daytona International Speedway, Indianapolis Motor Speedway, and Laguna Seca, have been recreated from 3D laser scans. Talk about extravagant!